amp seems to be the obvious problem without even using star scanner. the amp is probably 150 F to the touch, fan not spinning either. That hot and not emitting any sound, has to be an issue. cars a freaking nightmare. Cant keep up with the hidden underlying issues. Putting it into storage for now. Drive belt is shot and I cant get my big hands in there to change it. Now why would the car all of a sudden be a nightmare because the drivebelt is shot? Belts are consumables, just like tires and brakes. Relax, ...... all this car needs is some TLC! lol i may be being slightly dramatic. Just needs an amplifier which I have sent off. Then the left front suspension is creaking which I believe is the lower control arm/ Both front CV axles are shot and causing noises and vibrations. MB wants $1300 a piece for axles which is insane. The belt is not a big deal but looks like a chore to replace. The belt is easy to replace, lock the belt tensioner, take of the old and put on the new. if you have the right tools. This isn't a new car, it's going to need maintenance, stuff will go wrong with it. Yes, we are aware of the current situation/status and I believe it was mentioned that even below 10K it cannot/should not be considered a bad buy. This isn't a new car, it's going to need maintenance, stuff will go wrong with it. FeBest offers CV axles for less than OEM and a local person can install them, doesn't even have to be a Mercedes guy. hey easyphil, febest says they do not sell it for the s550. have you bought for your s550 from them? Looks like you are missing a bolt on the front wheel! WOW! You have a very good eye. Just picked up a 07 S550 with 246,000 miles for $3,000. This car is literally show room new and has a carfax 7 pages long with all maintenance completed only at Mercedes dealers. The car rides like a dream and the interior looks perfect. It really is insane. Needs some front suspension work as there is some creaking on the front left side happening but otherwise nice. Gorgeous! I love it. I just picked up an 08 S550 4 Matic with 125,000 miles for $14,000. Mine looks exactly like yours. They are stunning cars. Just paying attention to detail, ...... lt's my OCD. Would be interested to know the latest status on this car. 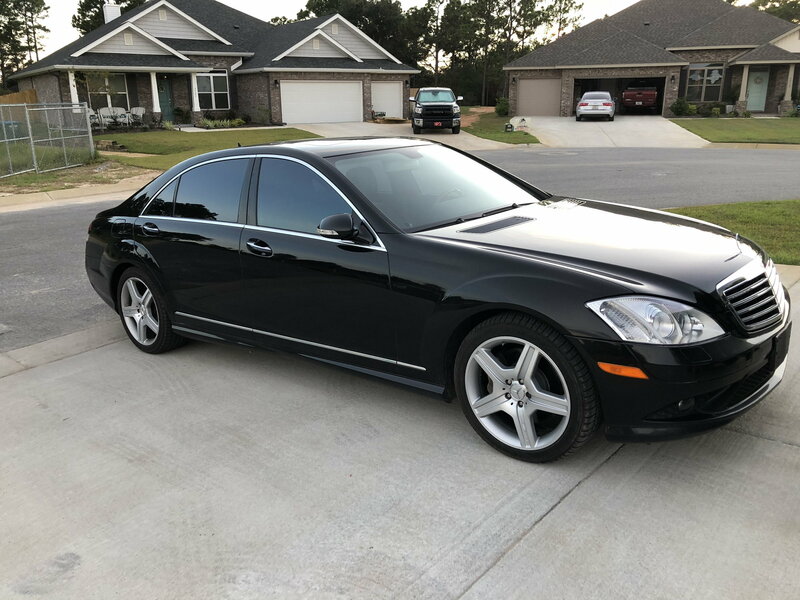 2007sclass, ........... got any updates? Some updates.... got the new front CV axles in, four new control arms up front to address the creaking issues. Got a new wheel to replace a bent one that was causing a vibration. Still need to address the fact that my transfer case is shot. Waiting on my amplifier to be repaired at Becker. Put a new drive belt and tensioner on. Car is very nice to drive. Just got to work out the neglected bugs. I still think I have some other suspension issues. The rear right makes a noise of some sort albeit small when I go over speed bumps. So I am going to look further into the suspension to make sure all is well. Thanks for the update and good luck with taking care of the remaining issues. in the end not a good deal lol. already needs easily 3,000 in work. between stereo, front cv axles and creaking suspension. My head is already spinning lol. One thing at a time I suppose. I must tell you, that this is an amazing story. I keep looking at the picture of the car and it is GORGEOUS. I get the feeling that you will INDEED work out the bugs and get it where you want it to be once again. It might not be as fast as you like in terms of getting all of the work done but it will be a very interesting journey. Tell me, do you do the work yourself? Dealer? also, I will indeed work the car out. I will sort out whatever remaining suspension issues there are, and get the transfer case fixed. The car is immaculate and I will not stop until shes top notch again. Remember, this was a $100,000 vehicle when new and parts for it can be very expensive. Based on the mileage, several parts could fail at any time. This might be why older high mileage vehicles are available at low cost when the owners realize the potential high cost to maintain them. I will not stop until shes top notch again. And this is the only way to do it !!!!!!!! yep! cant wait... shes coming along nicely. More like 85k-90k but yes, still expensive.